Cut vegetables are normally processed and stored in frozen form. We offer fully automatic and semi-automatic plants for frozen vegetable processing. 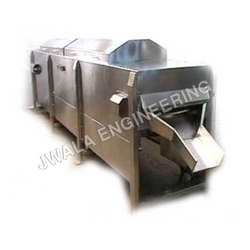 The plant includes preparation machines like peeler, slicer, dicer etc. and processing machines for washing, blanching, cooling, dewatering etc. The number and size of machines depends upon the capacity of the plant. Suitable for cooling of the vegetables after blanching to bring its temperature down before it goes to the IQF for freezing. The product is passed through chilled water for specified amount of time on a modular belt. The cooling time is controlled by adjusting the belt speed. After cooling the belt then lifts the product out of water and discharges it to the cooler. Suitable for blanching the vegetables. The vegetables are heated in hot water for specified amount of time to deactivate enzymes thereby ensuring blanching. Body frame made of SS square tubes. The legs of the frame will extend upto the ground level. Modular plastic belt with cleats.